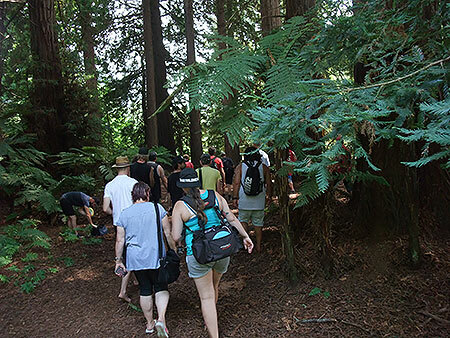 As we have done for the last few years now the NZDG National tour kicked off with a weekend protected from the summer heat in the shade of the giant redwoods on the Scion Research property in Rotorua. Well done to Simon Feasey and his crew who had spent a couple of weekend's prior to the event re-designing the course and installing the extra baskets to make this a stunning 18 basket course in an amazing situation. [Bring on the Course & Tee signs]. Saturday morning saw a great turnout of 44 players listening intently as TD Simon Feasey explained the new layout, which improves the flow of the course immensely and adds a few new challengers as well. With 5 par 4's the course is now a Par 59 which this reporter thinks is very fair and the scoring seemed to back that up. Jackson Sullivan's second round 53 [6 under] was the best round of the weekend but as Simon Feasey showed, it's really about consistency as he meticulously shot 3 rounds of 54 to take out the opening event for the year. It's great to see most players sticking around to watch the skills on display in the 'Super 6' as well and I'm sure those that make the cut really appreciate it. Congratulations to everyone who made this another great NZDG event, and well done to the divisional winners, Simon Feasey Open, Blair Joines Masters, Chris Sinai GM, Pete Boyle SGM, Gemma Sullivan Woman's, Ming Menzies WGM. New Two - The new hole 2 caused some problems. Here West Auckland golfer Lance Hartwell struggles to make par. 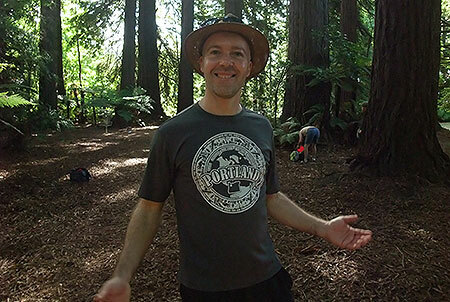 Croucing Bear - Also back in NZ for some summer sun Canadian Mark Dakiv enjoying a weekend in the Rotorua Redwoods. No Sleep Siep - Waiheke Island golfer Siep Van Vleit back on the tour and keen to make another top finish. 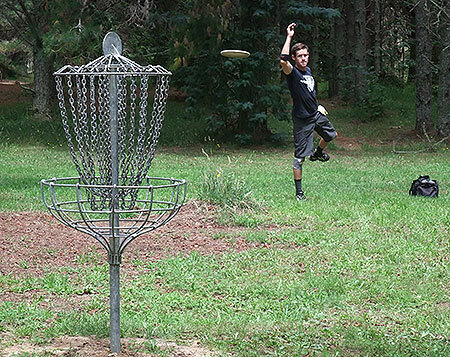 iPutt - Consistent performer Brady Kuech from Wellington was taking some time settling in to a rhythm. Spectator Madness - The 'Super 6' gallery rushing to get advantage points as the top golfers headed into the shade. Honey, I'm home! 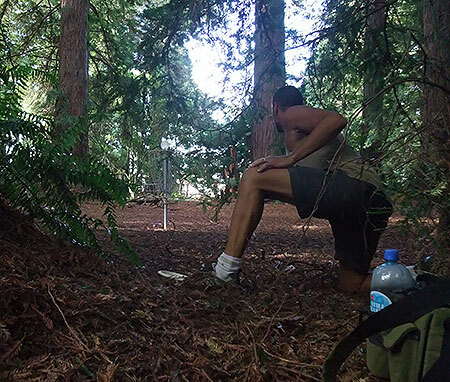 - Berlin Disc Golfer Moe Doerken happy to be back down under in the summer sun. 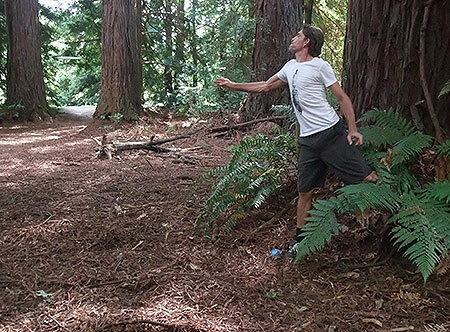 At home in the trees - Woodhill Park manager Haydn Shore battling through ongoing injuries. 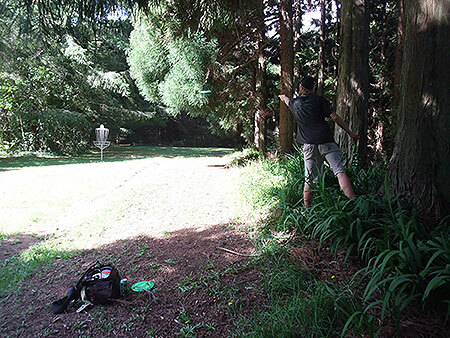 Lilio Lays Low - After a break away from competition Disc Golf for a few years Taranaki's Elias Lilo was happy to be back. 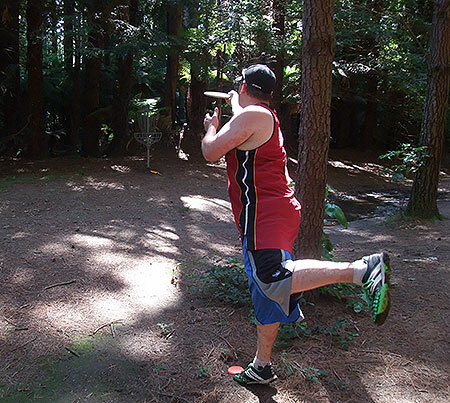 Upper Hutt Upper Cut - Ryan Kitto from Wellington's Upper Hutt was keeping some aces up his sleeve for the next event on the tour. The 'Isengard' on his back yard course. The 2016 Rotorua 'Super 6' - Blair Joines, David Keene, Simon Feasey, Jacko Sullivan, Logan Papuni & Mark Dakiv. "Sixteen paces to the Left..." - TD Simon Feasey explains the new layout. 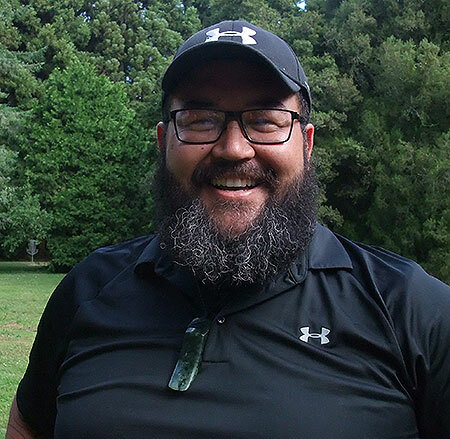 A Cut Above - West Auckland golfer Damian Peters back on the tour and playing some great golf. Vere is ze Snow? - Touring German golfer Moe Doerken was suffering a little 'jet-lag' after flying in the day before the competition. Sullivan style - Shane enjoying the shade of the Redwoods. 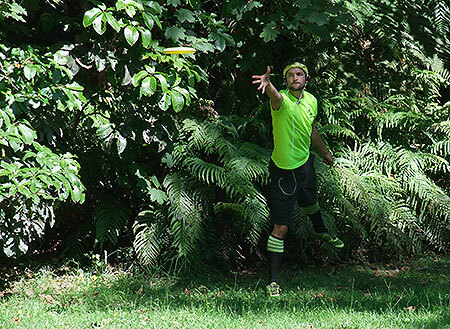 Watched - The gallery watch one time local Logan Papuni putt out the first hole of the 'Super 6'. Followed - The winning putt. Simon takes it by 10.